Java is pretty amazing. With list of thousands of APIs and utilities you could create any types of tutorials. Today I had a scenario in which I needed to have my program running forever. Wanted to check upstart script in Ubuntu OS. I could definitely do that by running Tomcat process but why not we simply create a Java Program which runs forever. Logic is very simple. There are multiple ways. Create a while loop inside main() thread which waits for every 2 seconds and prints latest timestamp in console. Same way infinite for loop. Want to generate OutOfMemoryError programmatically? Let me know what you think. * Program: How to keep a program running until the user terminates it? Please notice synchronized keyword in above program. 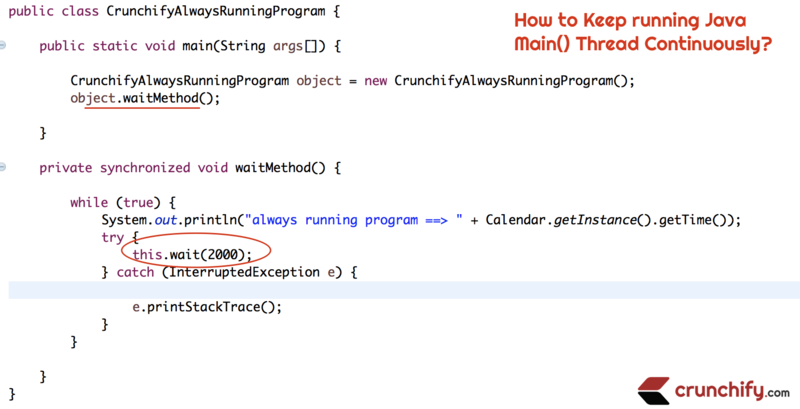 If you remove that then at compile time there won’t be any exception but at run time you will see below exception. Now run your program and you will see below result. I hope you find this simple tutorial useful running your java program indefinitely.